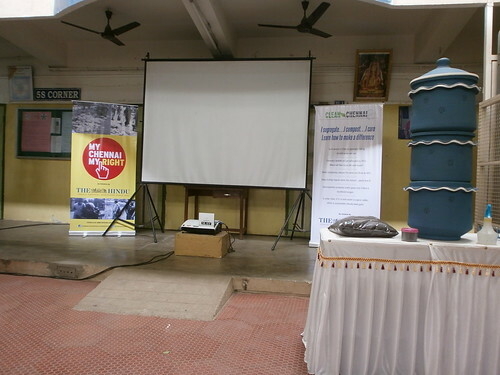 Before a few days, I went to the Clean Chennai @ Home workshop conducted by The Hindu, in Nungambakkam PSBB School, as a part of their My Chennai My Right campaign. This was done to show us how to effectively compost all our organic waste generated in the kitchen (left over food, vegetable/fruit waste, etc.) and use it as a manure for terrace/kitchen garden & how to (try and) recycle other solid waste. There are only two large waste dump-yards in Chennai (Kodungiyur, Perungudi) and they are overflowing. The third one (proposed at Redhills) is facing a lot of resident opposition. Add to it the plight of the conservancy workers (who work in inhuman conditions). When organic waste mixes with toxic/inorganic waste, it seeps into the earth and pollutes the groundwater. Of course, materials like plastic, metal-coated wrappers, napkins/diapers, etc. will not de-compost for a few thousand years. Do you know the reason for all these problems? Our irresponsibility and inaction. 51% Compostable/Organic waste, 31% Recyclable waste, 18% Partially recyclable & non-recyclable waste. That means, around 82% of the waste we send to the dump-yard, should have never been there in the first place! This 82% waste not only creates a huge mess and pollution, but can also make us considerable amount of money. Instead of having one dustbin and throwing all the waste there, we should have two dustbins and collect organic/compostable waste separately and non-compostable waste separately. All recyclable waste (that can be given off to waste-paper mart) should be stored elsewhere and exchanged for money, so that it can be recycled. They also showed us a system that has been developed to convert organic waste into compost, that can be used for growing vegetables/plants at home. Have a look at the three-tired terracota pots in the right hand side of the above picture. It seems, we can place it right next to the dustbin or maybe in the portico/verandah/terrace and collect all our organic waste there, mix it with dry leaves/coco-peat and within a few weeks, we will get manure. With the escalating prices of vegetables, this system not only saves us a lot of money (when we grow veggies at home), but it will also give us organic vegetables (without chemical pesticides) that are healthy. DailyDump.org is an excellent site where you can learn about composting and buy the required materials needed for it. 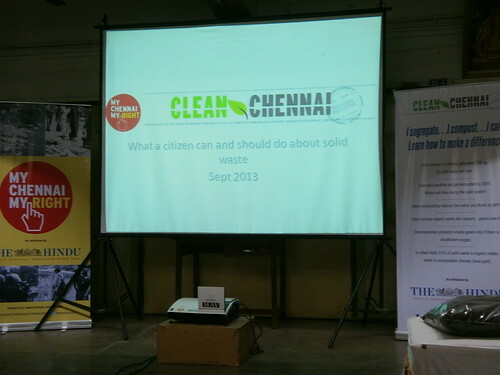 If you are in Chennai and if you want to start with something simpler, have a look at this. I am not sure why people are not open to the idea of growing vegetables at home, especially if we can just use our kitchen waste (and some water) to grow them? If we choose to become responsible citizens, I am sure others will follow. Don’t we want a clean city without pollution and less waste? This is an informative post.People have an idea on these though not adequately.Most citizens live in apartments or Housing board flats.There is no segregation of waste.All are dumped in a common place and removednot on daily basis.Many throw the wastes outside on the road mostly near transformers.The blue enclosure is closed and remains empty.The conservancy staff are inadequate for bulgeoning population.There is no space in complexes to grow vegetables.Disposal of garbage is a big problem for municipalities.Peope have also low civic sense.Good you highlighted the issue. Even for people living in apartments, it is possible to grow some plants in their balcony, windows or terrace (if allowed). Or compost can be prepared and while going on a walk, one can put it around plants on the lanes/roads. 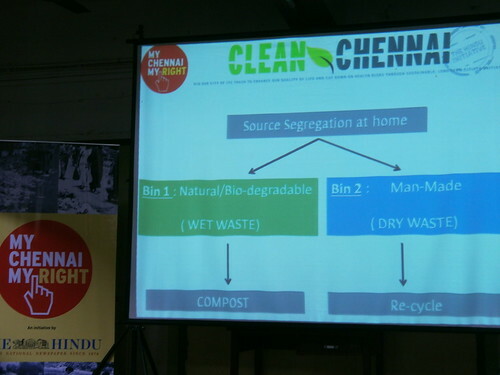 The idea is to eliminate organic waste going out of the house. That is very important. 82% !! That’s a whopping figure. Managing waste by the way you have mentioned in this post is a win-win situation for all, then why we don’t make it a way of life! I am able to read between the lines: You talk SO much, but what have YOU done YOURSELF? Even apartments have balconies/porticos that get some sunlight, which is sufficient to grow plants. If an apartment doesn’t get any sunlight at all, it’s time to change the house. Nice to know that this initiative has come to Indian cities also. People went to multi-story buildings from houses with back-gardens.They lost the skill to recycle biodegradable waste of house. This type of movements are must for the Indian cities & it can easily gel in with past traditions. If people want to, they can grow veggies in multi-story buildings also. I know a person living in DLF apartments here who has planted more than 500 plants inside and around his apartment. His house looks like a jungle! “Our irresponsibility and inaction.” very true! many of us know this, but laziness could be the reason first and carelessness is nother. Yes, that includes me as well!